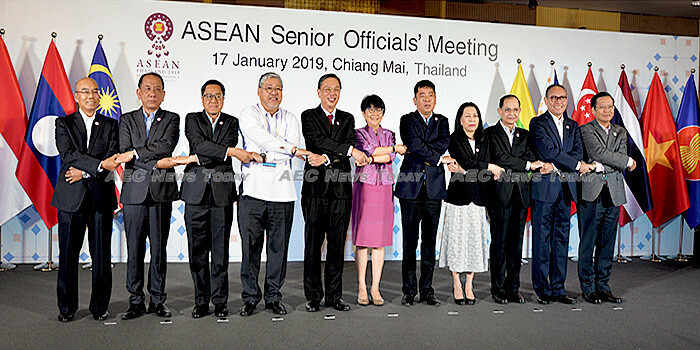 Asean foreign ministers and senior officials have gathered in the northern Thailand city of Chiang Mai for the 2019 Asean Foreign Ministers’ Retreat (AFMR) and the Asean Senior Officials’ Meeting (SOM). The meetings signify the first major events of Thailand’s year as Asean chair and the first opportunity for it to lay out its priorities for the year ahead. Advancing: to be future-oriented and better prepared for the future by making use of the technological advances from the Fourth Industrial Revolution, while building immunities against disruptive technologies. Partnership: to strengthen partnership at all levels and enhance connectivity to realise a seamless Asean that is linked to other regions through the region including “connecting the connectivities” and closer people to people ties and Asean identity. Sustainability: to promote sustainability in all dimensions, including sustainable development cooperation, so that we can realise ‘sustainable Asean’. The three pillars compliment what Thailand sees as the next 3Cs of Asean, creativity, complementarities, and continuity (See: Thailand to lead Asean with creativity, complementarities and continuity (video)). While the Asean 2019 website established to disseminate information provides some details of what will be discussed, local English-language newspaper the Bangkok Post has provided more insight. Citing a draft chairman’s press statement allegedly obtained by Kyodo News, it reported that the AFMR will also visit topics such as the ongoing Rohingya crisis in neighbouring Myanmar, the South China Sea, the Regional Comprehensive Economic Partnership (RCEP), and East Timor’s desire to join the Asean bloc. According to the report, the thorny issue of Rohingya refugee repatriation is said to be high on the agenda. If so it would demonstrate Thailand’s preparedness to support its rhetoric of a more inclusive and people focused Asean with actions.